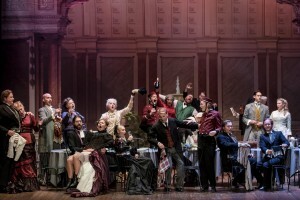 The free group “Kammaropera Syd” with tenor Rickard Söderberg put together a fabulous, as well as ambitious, operetta in Ystad, Sweden, now for third year in a row. This year they had chosen the music from various operettas and created a completely new story. The text was written by Rickard Söderberg. I had the privilege to play the part of Countess Olga in their updated “Merry Widow” last year, and this year at “Teaterhotellet” (The Theatre Hotel) I played the role of a suffragette, Stina Quint. The cast was amazing and the show as well. We played a total of 12 shows in 10 days. Quite an intense period, but fantastic to be working with a bunch of passionate professionals in an inspiring project!